Tired of tripping, stumbling or falling in your own home? We get it, and we would be, too. Though your carpet might have been perfect once – smooth, tight, taut and beautiful – years of use, heavy furniture and family pets can alter it. It can get bumps, folds, buckles and other imperfections, and in the end, you’re left with an uneven, unattractive surface. It can trip you up, catch on your shoe or even cause you pain and injury! If you have little ones in the house, it can be even more dangerous, and it’s something that needs fixing ASAP. Forget replacing your carpet or patching it up. Instead, consider carpet stretching – a simple, affordable and fast service that can address these unfortunate carpet issues instantly. With our Coquitlam carpet re-stretching services, we realign, straighten and reset your flooring to remove any unwanted bumps and wrinkles. We can even get rid of folds and bubbles around the corners, and all without any patchwork or new materials. And the best part? 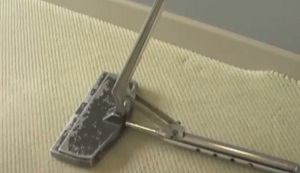 Carpet re-stretching doesn’t just fix unsightly bumps and waves. It also prevents further damage to the carpet fibers, extends the life of the carpet itself and brings a luster back to the floor that was long since lost. Do You Need Carpet Stretching? It’s not always easy to spot carpeting issues, but if you find yourself tripping in one area of the room quite often, there’s likely an issue. Carpet bumps are nothing to be ashamed of. They come with time, and moving furniture, cleaning your carpet or just milling about your house can all have a hand in causing it. Want to fix your carpet issues? Our Coquitlam carpet stretching services can help. We have more than 30 years serving the Coquitlam area, and we’ve worked with dozens of residential and business customers just like you.